Strictures at the anastomosis of the ureter to an ileal conduit urinary diversion or continent urinary pouch or conduit are almost always benign and reportedly occur in 4% to 30% of patients (149-151). One study that compared complications in the different forms of urinary diversion reported the incidence of ureteroenteric strictures in ileal conduits to be 6.5%, compared to 10.0% in the continent reservoir group and 13.6% in patients who underwent ureterosigmoidostomy (150). The predisposing factors are ischemic necrosis and subsequent fibrosis and stricture, due to excessive mobilization and skeletonization of the ureter. Preoperative radiation therapy appears to have a compounding effect. Extravasation at the anastomosis may progress to scarring and subsequently a stricture, and, rarely, recurrent tumor in the ureter may present with obstruction. Stenoses tend to be more prevalent on the left side, probably because of the necessity for high mobilization of the left ureter (to ensure a gradual course to the right), which often requires the middle ureteric artery to be sacrificed (152). Rarely, ureteral obstruction can be due to extrinsic compression by a crossing vessel or to compression at the site where the left ureter is brought through the sigmoid mesocolon into the peritoneal cavity to be anastomosed to the ileal conduit. Strictures can predispose patients to urinary infections, stone formation, and loss of renal function, which can often be clinically silent. Surgical revision of anastomotic strictures is technically difficult because of fibrotic adhesions from prior surgery and, frequently, prior radiation therapy. Nonoperative interventional therapy has been embraced as an alternative, but results to date have been disappointing and not equivalent to those of surgical repair. However, the lower morbidity of interventional techniques and the ability to perform open repair if the interventional procedures are a failure justify the continuing primary application of interventional and endourologic procedures. The diagnosis of an anastomotic stricture is made when an intravenous urogram, renal ultrasound, or CT scan demonstrates progressive hydronephrosis and/or a loopogram demonstrates the absence of ureteral reflux in a patient in whom the diagnosis of a stricture is being entertained. Ultrasound examination in this situation, although highly sensitive, demonstrates a specificity of only 50% because of the high prevalence of dilated collecting systems that are not obstructed in patients with ureteroileostomies (153). Both antegrade and retrograde studies are performed in an attempt to define the site, length, degree of narrowing, and possible etiology of the stricture. Brush biopsies are performed if there is a concern that the stricture may be malignant (Fig. 9). There is a consensus that malignant obstruction is best treated by ureteral stenting and drainage. Ureteroenteral anastomotic strictures are best cannulated through a combined antegrade and retrograde approach (154). Nonrefluxing strictured anastomoses are difficult to catheterize in a transconduit fashion, with success in only 14% to 56% of patients (155,156). Continent diversions, whether cutaneous or orthotopic, are treated by the antegrade route. The retrograde route is usually successful in catheterizing patent ureteroileal anastomoses in 85% to 100% of patients (Fig. 9) (155-158). The procedure is required in patients with a patent ureteroenteral anastomosis for draining partially obstructing ureteral strictures, for extraction of renal or ureteral calculi in patients who would otherwise require a PCN, and for brush biopsies of filling defects in the collecting systems (Fig. 9). Endoscopy of an ileal conduit is not always successful in identifying or catheterizing the ureteroenteral anastomosis. Retrograde uretero-scopy has been reported to be successful in 10/13 patients with orthotopic ileal neobladder urinary diversion in one series (159). 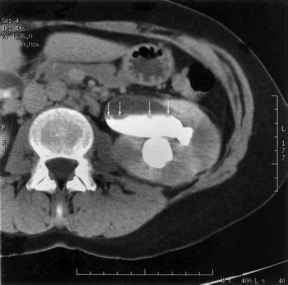 The radiologic management of a ureteroenteral anastomotic stricture in an ileal conduit consists of performing a PCN, maneuvering a guidewire down the ureter, across the anastomotic stricture, through the ileal conduit, and out the stoma; and then advancing a balloon catheter to the site of the stricture. High-pressure reinforced balloons of 8- to 10-mm diameter and 4- to 10-cm length are preferable. As with balloon dilation of other benign ureteral strictures, there is no consensus on the size of the balloon, the ideal period of balloon inflation, the necessity or desirability of repeat inflations, and, lastly, the size of the catheter used to stent the newly dilated anastomosis. The ureteral stent placement following the balloon dilation is performed in a retrograde transconduit fashion through the ileal conduit. The stent should have a large lumen with side holes only in the renal pelvis and it should be long enough to extend beyond the stoma into the ileostomy drainage bag. The standard 25 cm-long nephrostomy catheter is not long enough to protrude through the stoma into the drainage bag. Locking loop catheters that are 40 cm to 50 cm long are usually required (Fig. 9). Side holes along the shaft of the catheter should be avoided because intestinal mucus can reflux into the renal pelvis, and predispose to occlusion of drainage holes (137,157). The standard double-pigtail ureteral stent, with one pigtail in the renal collecting system and the other end within the conduit, is not appropriate for drainage in patients with urinary diversions to the bowel. The catheter is left in place for roughly six weeks, after which a nephrostogram is performed. If the stricture appears persistent, a second attempt at balloon dilation is made. 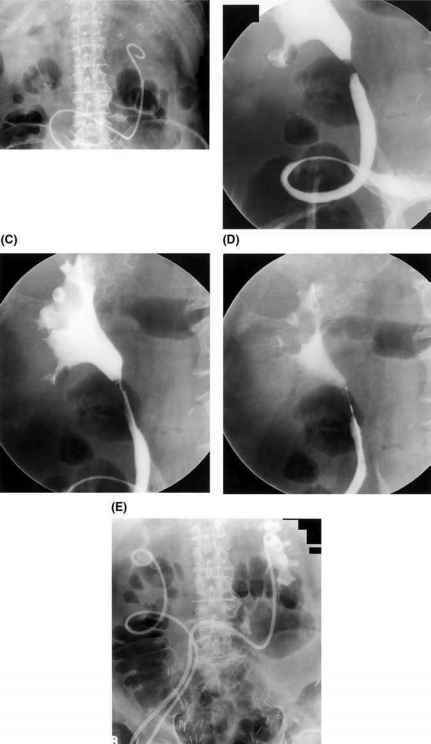 Because of the high recurrence rate of ureteral strictures after apparently successful balloon dilation, close follow-up is essential to detect stricture recurrence before renal function deteriorates. placed to drain the kidney. Placing a stent that can let mucus from the pouch reflux into the renal collecting system is not prudent because the stent can be easily occluded and cause sepsis (137).